Work really feels different with my new office space. I came to work today morning excited and I spent all day really chilled out, listening to my music, and working on some layouts. I got a lot of work to do and I am under a lot of pressure, but sitting at my desk now, staring outside the window is just really relaxing. 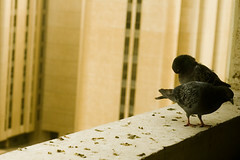 I am starting to notice the pigeons a lot more now since they live right outside my window. One thing I noticed, pigeons are really horny... all the time. They are always kissing each other and trying to hump one another. I don't know if this is how pigeons play but to me it looks all very sexual. Its cool though the way they just hangout all together. Its like starbucks but for pigeons outside my window. We seem to be a very popular location, I guess because of the view and the great nesting area. Maybe I should draw some stuff and stick it on the window, this way I can add a bit of sophistication to their place. put a scare-crow and some cat photographs..
my advice would follow suit to edjamacated guy lol! how come the birds get most of the action! damn birds!